AUCTION CLOSING DATE: Monday, April 15th at 8:00pm. AUCTION INSPECTION DAY: **By appt. only** on Thursday, April 11th between 9-5pm. REMOVAL DAY: Wednesday, April 17th from 3-7pm. 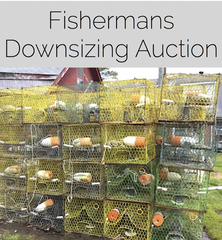 Invoices will be processed and emailed to the successful bidders on Tuesday, April 16th by 12pm. There is a 15% buyers premium that will be added to your final purchase price. Cargile Auctions LLC is a family owned, full-service auction company committed to delivering the highest quality Real Estate and Personal Property auctions for trust officers, banks, mortgage companies, attorneys, and Courts, as well as individuals. With over 30 years of experience in Real Estate sales and 13 years in the auction business, we are dedicated to bringing buyers and sellers together.